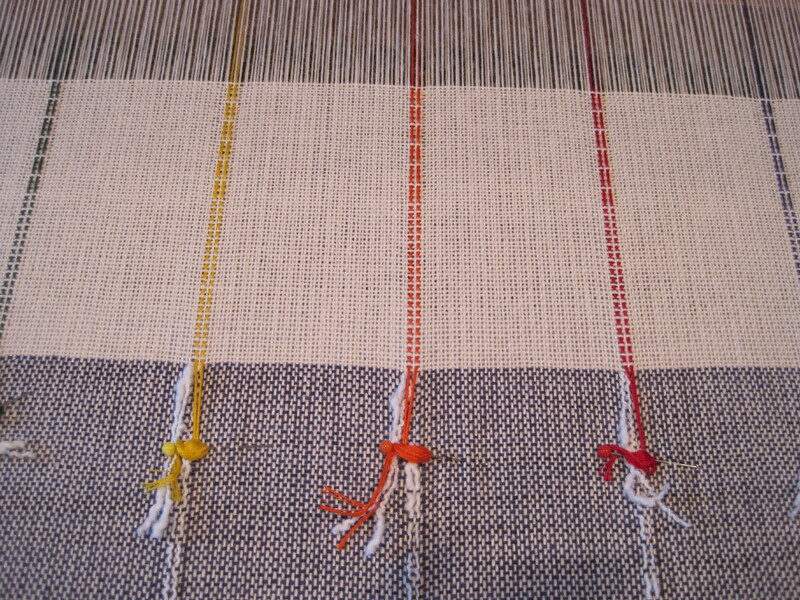 After the warp was finally on the loom correctly the weaving itself was fairly quick and easy. For the first towel, the decorative threads were 2/8 cotton in dark green. 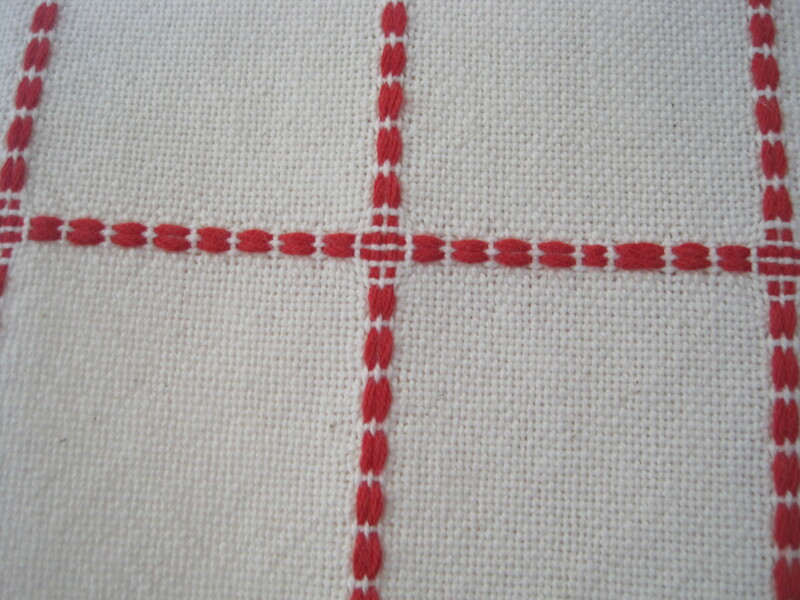 The design showed up as lengthwise lace threads in the warp direction, and crosswise lace threads in the weft direction. I squared up the blocks to achieve 2.5 inch squares. For the second towel I used 2/4 cotton in red. 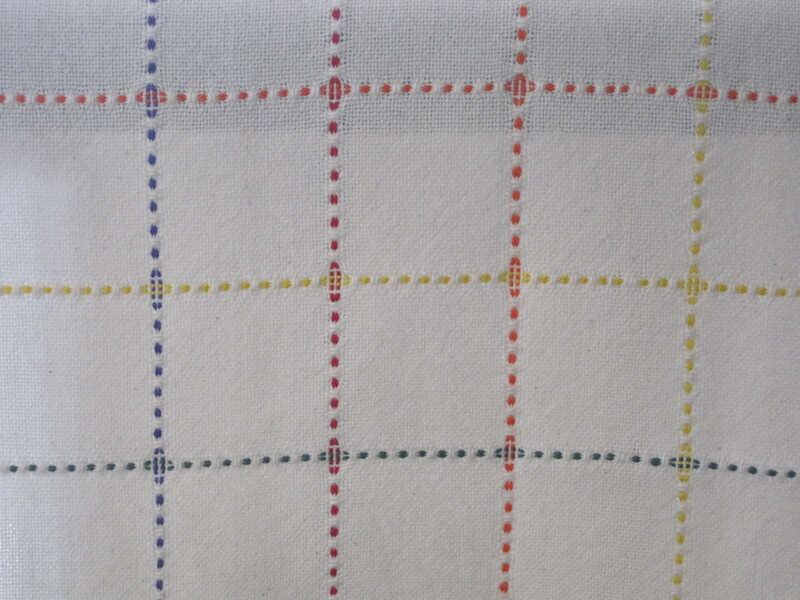 This gave a more textured feel to the decorative grid as the 2/4 cotton is thicker than the 2/8 cotton used for the plain weave sections in the towel. 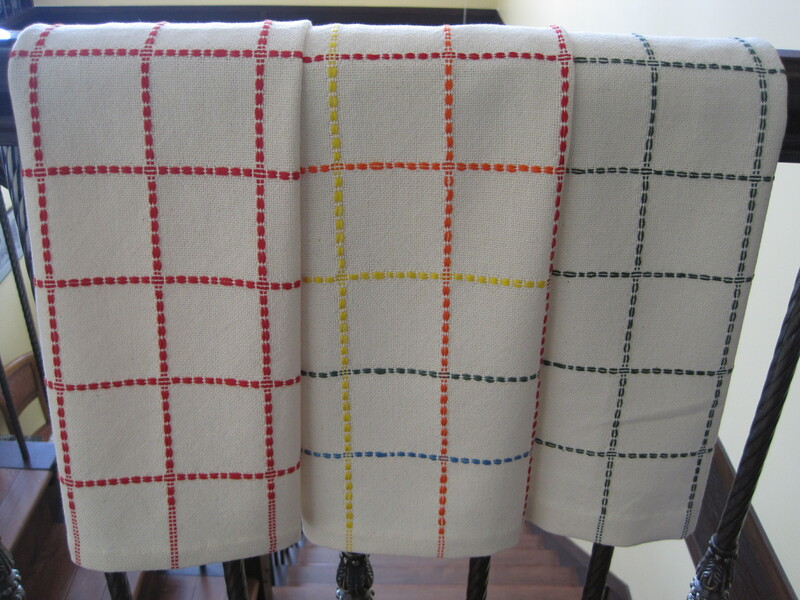 For the third towel I used DMC embroidery floss in primary and secondary colours. This turned out to be my personal favourite. The colours and shine of the floss just make me happy. 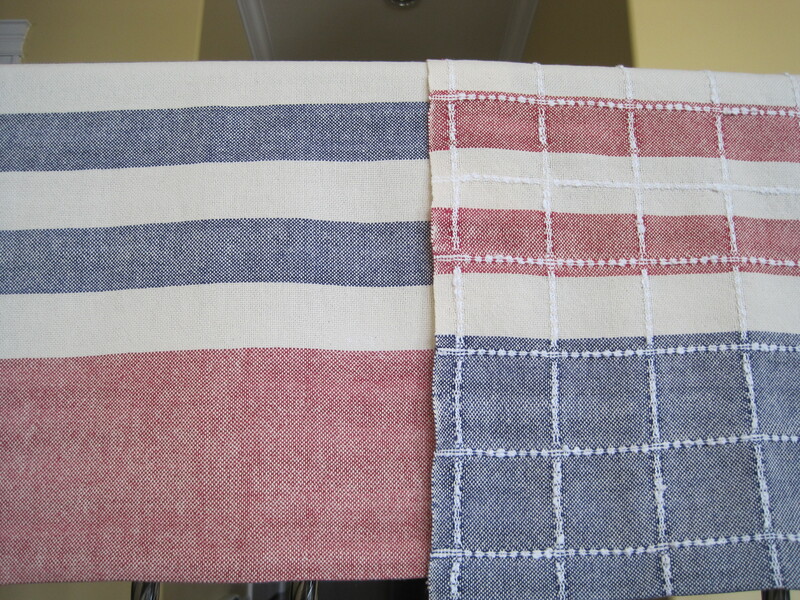 In truth these towels didn’t look like much on the loom. I was worried that the grid would be too large, that the sett of 18 e.p.i. would be too loose. But a hot wash and a good pres, and the towels are exactly what I wanted. and the reverse side looks pretty too. 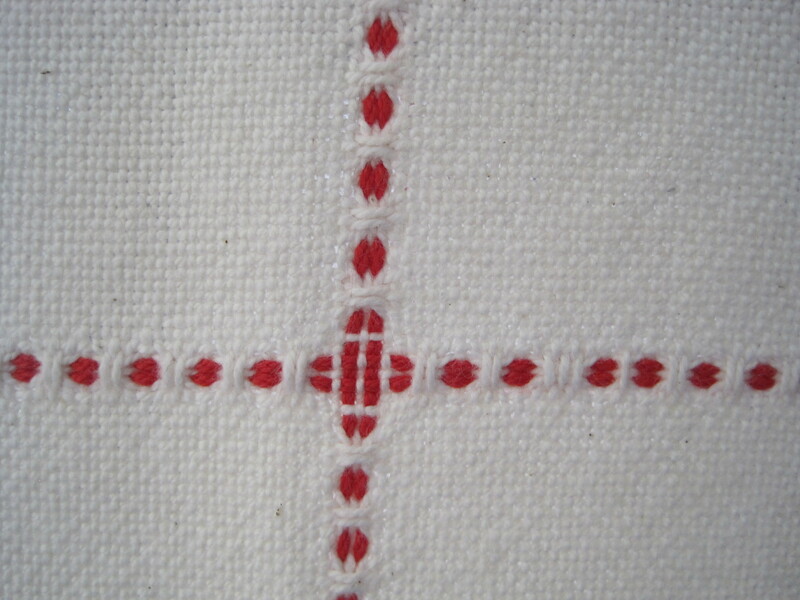 I like the pattern formed where the decorative threads cross one another. I still had some warp left, so I next experimented with adding some colour stripes to the background, and used a soft cotton boucle as decorative threads. 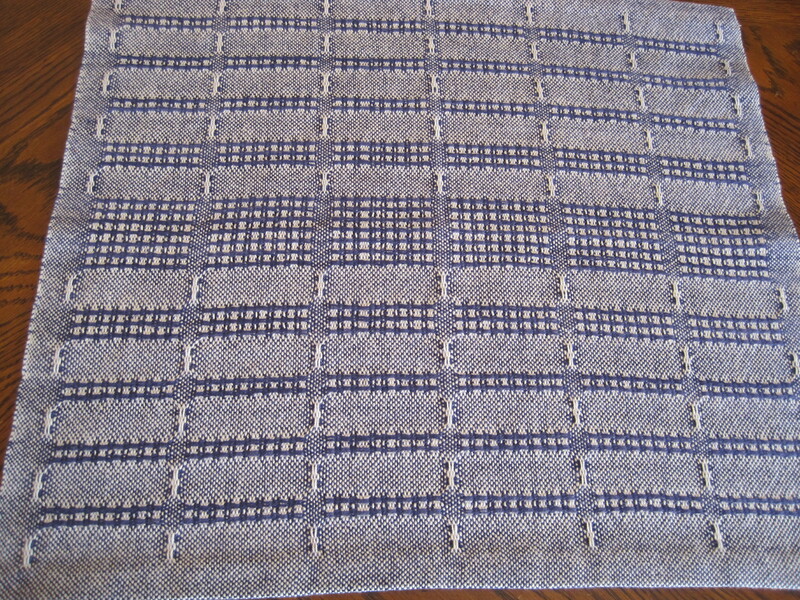 As I only had enough boucle in my stash for one towel, the last towel was completed in plain weave colour stripes in reverse colours of towel 4. I only had about 15 inches left on the warp, so I played around with the lace to make a square that could be used as a bread-cloth, or table mat. For those who want to know how I was able to change the decorative threads for each towel, here is how I did it. 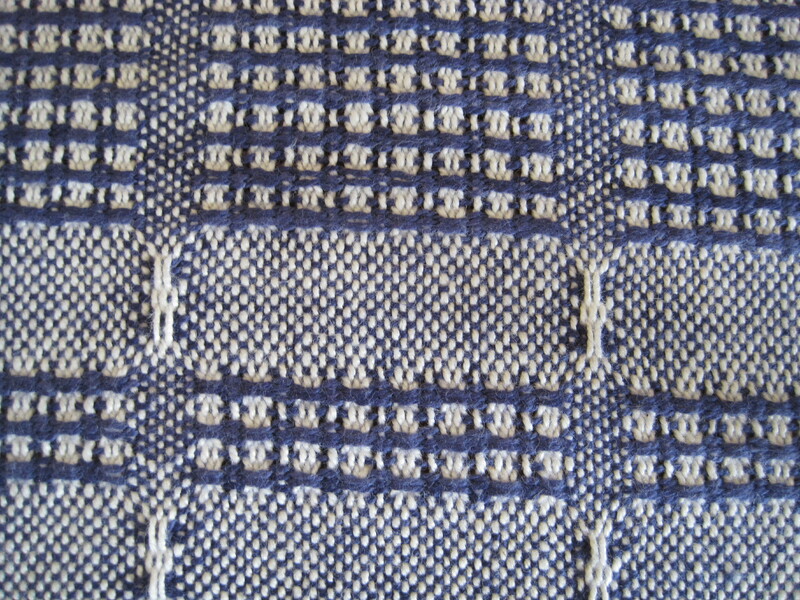 After weaving a towel, I cut the decorative threads and tied on the new yarn. 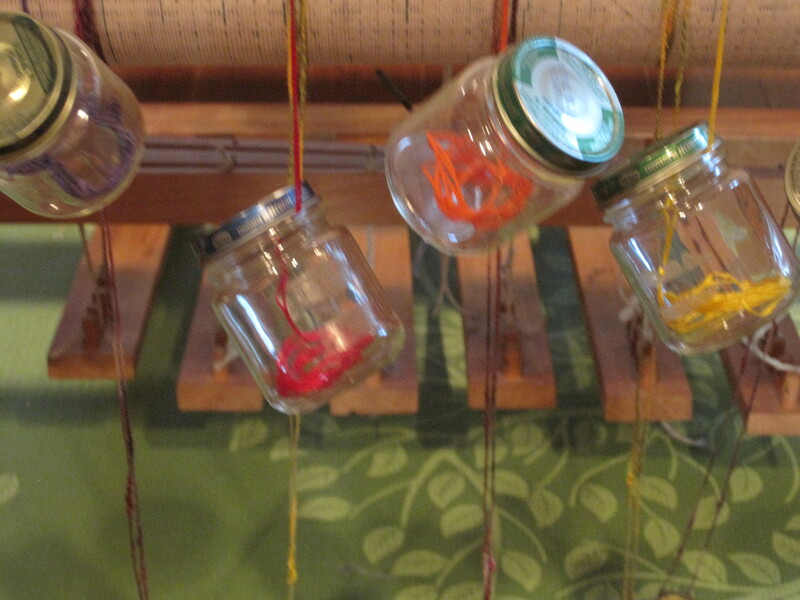 I pulled the new yarn through the heddles and reed and then anchored the new yarn to the web at the front of the loom with pins, and weighted the yarn at the back of the loom using empty baby food jars or coin-weighted prescription bottles. the excess yarn was tucked inside the jars/bottles, and pulled out as I advanced the warp. There were only 7 pairs of threads that needed replacing across the warp so it really wasn’t much extra work. So simple. 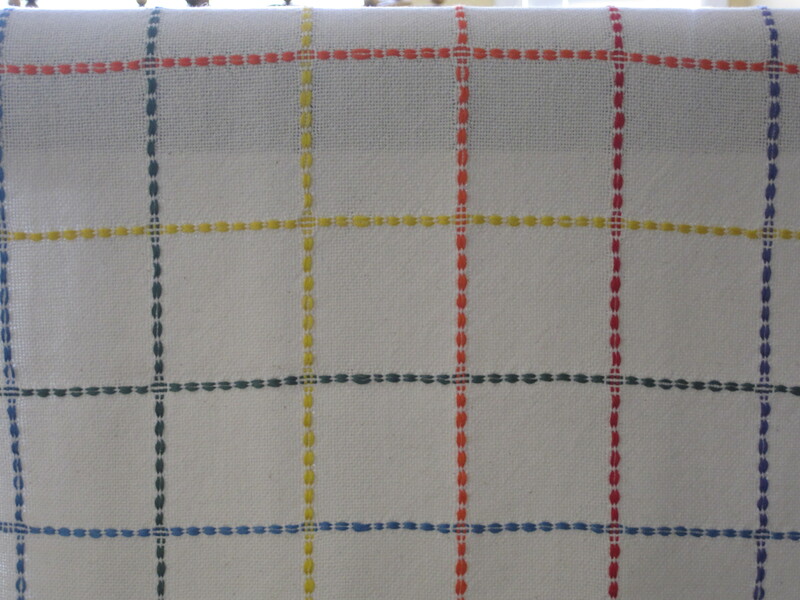 Six yards of warp produced 5 tea towels and one square cloth, with lots of room to play and experiment. This entry was posted in Weaving and tagged colour, cotton, DMC floss, hand weaving, Handweaving, handwoven, Loom, tea towels, Textile, towel of the month, Warp, Weaving. Bookmark the permalink. told you they would look too nice to use! These are great–I love the simplicity but they still make a statement! Thanks Kerry. I’m so happy with the results.